Leadership in organizations is important in influencing workers’ perceptions, response to organizational change, acceptance of health innovations, and scientific informed practice.18 However, there is little information on how public dental service CDs and HSMs provide support to therapists to enable them to embed scientific preventive care into clinical practice, such as the use of fissure sealants, application of topical fluoride, oral hygiene instruction, offering of dietary and smoking-cessation advice, and utilizing motivational interviewing techniques to improve compliance with preventive care guidance.5,19–24 Therefore, this study was undertaken to explore and identify 1) what CDs and HSMs perceive as factors influencing therapists to provide clinical preventive care to their patients, and to 2) record their recommendations supporting mechanisms for therapists to increase their clinical preventive activities. All NSW LHD oral health CDs (n=13) and all HSMs (level four and five) (n=9) were formally invited by email to participate in the research study. The one-on-one interviews were undertaken at convenient locations for the participants. They were requested to reflect and respond to key open questions that were used to explore 1) influencing factors that could support therapists to offer preventive care, and 2) to identify and record their proposed strategies to enhance therapists’ clinical preventive practices to ensure quality oral health care is provided for their patients. Ethics approval was obtained from the lead Health and Research Ethics Committee, Hunter New England LHD: HNEHREC12/02//15/5.04 and the 15 LHDs (LHD site-specific assessment ethics approval numbers are available on request). Of the 15 LHDs, 12 CDs (seven rural and five metropolitan LHDs) participated in the study. Two CDs represented two rural LHDs each (Northern NSW and Mid North Coast, and Southern NSW and Murrumbidgee LHDs), and one LHD (Far West) did not have a CD at the time. The Far West LHD was represented by their HSM. Nine LHD HSMs were invited to join the study, and seven (three metro and four rural) agreed to participate. 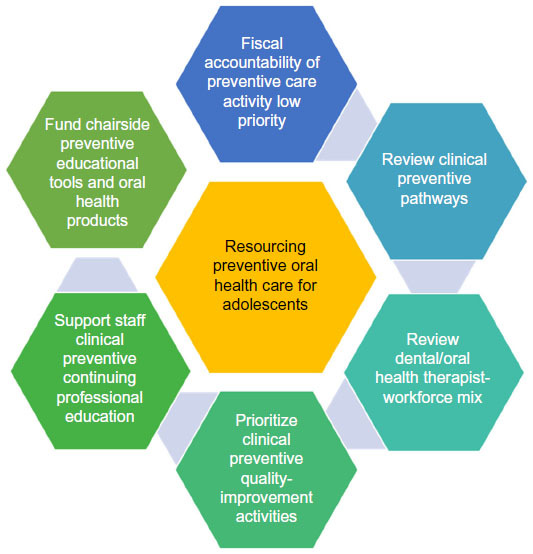 The main theme that emerged from this study was “Resourcing preventive oral health care for adolescents”; the theme was underpinned by key subthemes shown in Figure 1. Each of the subthemes are presented in more detail. 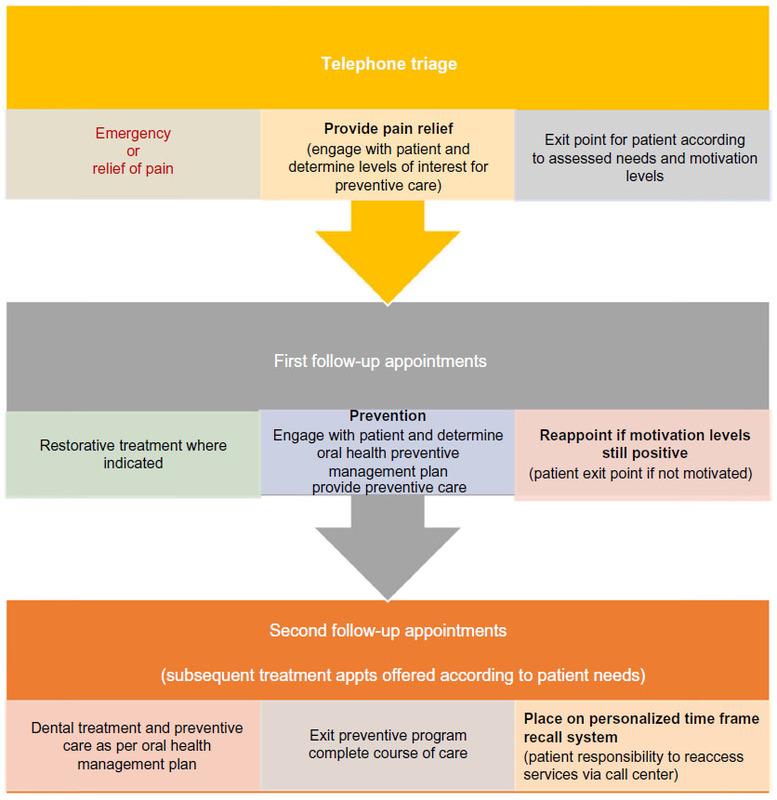 Figure 1 Resourcing preventive oral health care for adolescents accessing public oral health services in NSW illustrated and reported by clinical directors and health service managers. 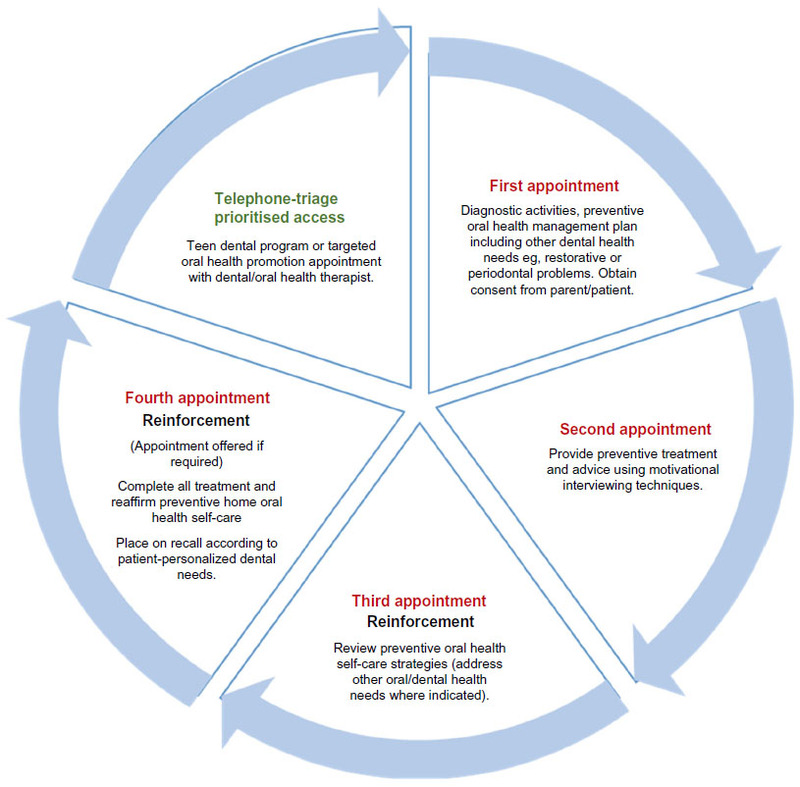 Figure 2 Adolescents on government benefit scheme and prioritized high-risk groups clinical pathway to preventive care depicted by clinical directors and health service managers in four local health districts. Figure 3 Comprehensive clinical pathway for adolescents prioritized for relief of pain in some local health districts. Conversely, most participants reported that often the TDP-eligible adolescents required restorative or invasive treatment at a cost beyond the allocated government funds, and so could not stay with the private sector and returned to seek restorative treatment with the public system, causing longer waiting lists. Some participants stated there was a public misconception of “long waiting lists to access public dental care” for adolescents across the LHDs. With a focus on managing waiting lists utilizing the clinical LHD professional team-support structures depicted in Figure 4, regular monitoring of administration processes supported by government benefit scheme funding enabled some LHDs to provide timely preventive care for adolescents (Figures 2 and 3). Figure 4 Professional clinical support structure for therapists, as outlined by clinical directors and health service managers in most local health districts. The importance of effective communication between triaging call centers with clearly defined processes for monitoring and measuring clinical activities ensured emergency patients had precedence over patients with less demanding needs. Well-structured appointment-roster systems for relief of pain utilizing all clinicians’ daily “unable to attend”-type appointments were processes that gave therapists leeway to insert preventive care appointments in some LHDs. Several participants argued that adolescent services were markedly different to adult services; therefore, therapists were able to provide full courses of treatment incorporating preventive care. Whereas others argued to maintain consistency and equity for patient access across LHDs, oral health management mandated structured appointment rosters to support patient access to dental care, with little flexibility for therapists to offer preventive care at specific visits. Figure 4 clarifies the relationships between the different levels of clinical oral health professionals. Organizational operational structures (Figure 4) were similar across the LHDs to support therapists and clinical oral health teams, with most CDs commenting it was work in progress. 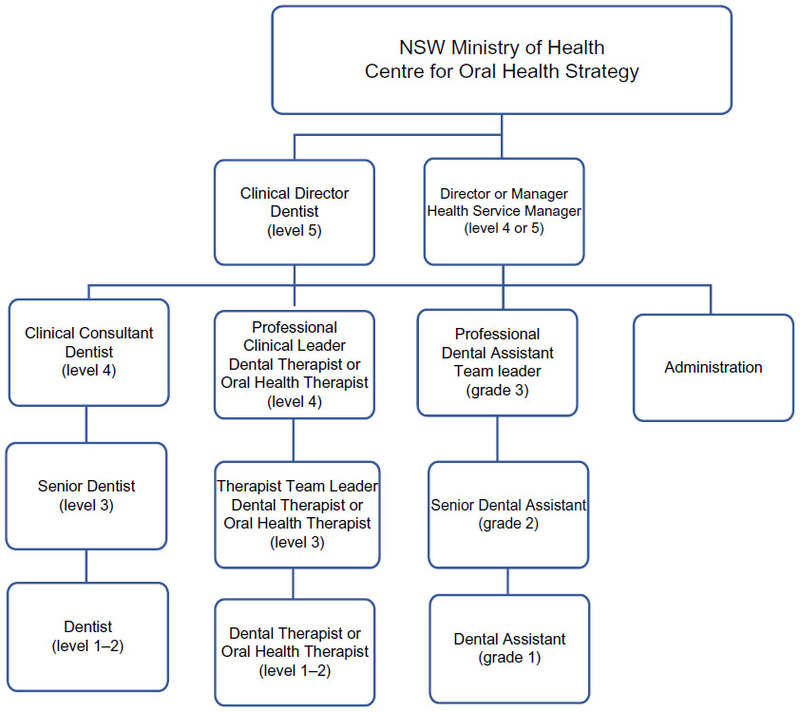 Therapist clinical leaders (TCLs) shown in the LHD hierarchical structure had a key role to uphold and account for therapists’ clinical preventive and oral health promotion activities. They functioned as advocates for therapists to access appropriate resources. These TCLs, in consultation with staff dentists (and HSMs where applicable), provided clinical support to frontline therapists. A few CDs commented that their pivotal role in providing clinical support to therapists was gradually being recognized, as LHDs moved toward strengthening multidisciplinary structures within clinical settings. The majority of CDs and HSMs stated that the daily management and communication with therapists was the TCLs’ responsibility. Several CDs reported TCLs obtained clinician preventive data from patient electronic health-activity reports and patient clinical oral health records to conduct peer-review sessions with therapists. They reported that to their knowledge, the lack of clinical preventive care offered by therapists was not highlighted as a major concern. Identifying “interfering factors” that impacted on a therapist’s ability to provide preventive care to adolescents was reported by most participants as raising their awareness of areas for clinical quality improvement. A few participants stated part-time clinicians lacked sufficient time to see patients or read health policies and meet mandatory training requirements, which could impact on their clinical preventive practice. For example, the participants were not sure whether staff participated in motivational interviewing training sessions held for therapists, or whether they attended LHD scientific conference programs. Professional development activities for therapists and clinical quality-improvement activities reported tended to intertwine and interrelate. Several respondents discussed recent graduating therapists’ knowledge base of the CMS and minimal intervention-dentistry philosophies and the uneven application in public health settings. The CMS for adolescents in public health settings was a concern for several CDs, considering the unpredictability of public dental demands, including adolescent’s psychosocial determinants of health. Nonetheless, several CDs highlighted the importance of professional clinical structures to support clinicians to introduce CMS and minimal intervention-dentistry concepts into clinical practice, thereby sharing knowledge with other colleagues. A few respondents commented on their LHDs’ prevention clinics as benchmark models of care for all high-risk patients, established in consultation with pediatric dental specialists and dieticians, the variations of referral pathways into prevention clinics, or standalone prevention sessions (Figures 2 and 3). Delegated therapist leaders were responsible for coordinating, monitoring, and providing LHD preventive care-orientation support. A few metropolitan CDs stated professional development facilitated by pediatric dental specialists was open to therapists across the state; however, whether therapists attended was subject to LHD management approval and support. HSMs all reported that external professional development to access contemporary preventive modalities was supported with funding or conference leave in consultation with therapists as a strategy to assist clinicians maintain annual professional registration. Preventive guidelines for different patient age-groups provided by pediatric dental specialists and endorsed by one periodontist were available in three LHDs. Referral pathways to dieticians were available in two LHDs with teaching hospitals. Two rural HSMs were considering how they could fund dietician positions for their LHDs. Nonetheless, access to fluoride toothpaste and toothbrushes was a norm for some LHDs, and a few LHDs also provided 5,000 ppmF toothpaste through state priority oral health promotion-funded youth and opioid-treatment programs. One other LHD was involved with a research project that enabled them to access family fluoride toothpaste and toothbrushes. Several CDs commented that funding was essential to support preventive strategies; however, they were reliant on the LHD HSMs’ funding approval. This study had two objectives: first to record CDs’ and HSMs’ views on factors influencing how therapists provided clinical preventive dentistry, and second to note how therapists could increase their preventive activities. The results show that these two objectives were inextricably combined, such that the themes identified in the data covered both objectives. The main issue raised is that preventive dentistry per se lacks strong support from the central funding agency and that increasing prevention activities is not a simple task of changing regulations or increasing professional education. Resourcing of preventive care for adolescents is a continual balancing act for NSW public dental health care leaders in association with meeting LHD performance targets. System processes to ensure equity and fairness of patient access to clinical care and changes to workforce legislation were other factors that influenced oral health leaders’ resourcing of preventive care activities. This is consistent with Marks and Mertz’s dental leadership research brief, where they reported that dental directors faced such challenges as maintaining or ensuring sustainable funding, increased emphasis on providing quality care, and the movement toward a pay-for-performance model and workforce changes.30 Conversely, it is noteworthy that participants in our study counteracted these challenges by viewing health reforms as opportunities for reviewing professional clinical leadership structures, improving clinical governance processes, and incorporating scientific oral health preventive measures for public health patients. This study illustrated various levels of a CD’s dependency on HSMs to approve and fund scientific-based preventive strategies. Strategies for therapists’ professional development was a work in progress, not only to enhance offering of clinical preventive care for adolescents, but inclusive of a holistic oral health service vision for the future. However, participants in this study omitted to comment on strategies to underpin therapists’ clinical leadership-development needs, as discussed by Brocklehurst et al15 and Nicol,31 as fundamental to building clinical leadership capacity in health systems. The government benefit scheme was a significant enabler in improving clinical pathways for adolescents to access preventive dental care as prescribed by the voucher.29 Skinner et al referred to the Child Dental Benefit Scheme as solutions for adolescents under 18 years of age to access dental care from the private sector.2 Interestingly, this study found that NSW public dental services are also heavily reliant on government benefit-scheme funding to support preventive care pathways for adolescents, an area for future public oral health research in terms of funding stability and direct funding for preventive care for adolescents under 18 years of age, as per its core purpose. The differentiation argument of adolescent care from adult services was an interesting point noted by some participants in this study. Clinical pathways for adolescents were distinctive, with therapists having the scope to provide quality oral health care. Illustrating installation of specific prevention clinics and sessions within the current health care system solidified the few participants’ stance for potential adolescent preventive models of care in their LHDs. The respondents had a vision of creating a culture of clinical excellence for oral health, incorporating therapists’ timely provision of oral health care and preventive advice for adolescent patients in accordance with the NSW State Health Plan to deliver “world class clinical care”.17 NSW Health have devolved decision making to a local and regional level to augment transparency of funding and monitoring of performance.17 Although participants illustrated professional structures underpinned by strategies to enhance therapists’ preventive clinical practice, the complexities and interrelationships governing NSW clinical oral health services appeared uneven across LHDs in terms of human resources and funding for goods and services. Resourcing and supporting therapists to provide timely and appropriate levels of preventive care to adolescents attending public dental services was important to CDs and HSMs. The main issue raised in this study is that preventive dentistry per se lacks strong support from the central funding agency, and that increasing prevention activities is not a simple task of changing regulations or increasing professional education. Funding was received from the NSW Ministry of Health Rural and Remote Allied Health Professionals Postgraduate Scholarship Scheme and Centre for Oral Health Strategy. Appreciation is extended to NSW local health districts oral health clinical directors and health service managers for participating in this study. All authors contributed toward the design of the study, preparing and critically revising the paper, and agree to be accountable for all aspects of the work. The authors report no conflicts of interest in this work. The findings from this study are those of the authors and do not reflect the views of the funding body or the NSW Ministry of Health. Armfield JM, Spencer AJ, Brennan DS. Dental Health of Australia’s Teenagers and Pre-teen Children: The Child Dental Survey, Australia 2003–2004. Canberra: Australian Institute of Health and Welfare; 2009. Australian Institute of Health and Welfare. Australia’s Health 2014. Canberra: AIHW; 2014. Health Statistics New South Wales [homepage on the Internet]. Available from: http://www.healthstats.nsw.gov.au. Accessed August 26, 2014. Moynihan PJ, Kelly SA. Effect on caries of restricting sugars intake: systematic review to inform WHO guidelines. J Dent Res. 2014;93(1):8–18. Bernabé E, Sheiham A. Extent of differences in dental caries in permanent teeth between childhood and adulthood in 26 countries. Int Dent J. 2014;64(5):241–245. Spencer AJ, Harford J. Improving Oral Health and Dental Care for Australians: Prepared for the National Health and Hospitals Reform Commission. Canberra: Ministry of Health; 2008. Available from: http://www.health.gov.au/internet/nhhrc/publishing.nsf/Content/16F7A93D8F578DB4CA2574D7001830E9/$File/Improving%20oral%20health%20&%20dental%20care%20for%20Aust.pdf. Accessed May 30, 2011. American Academy of Pediatrics. Guideline on caries-risk assessment and management for infants, children, and adolescents. Pediatr Dent. 2012;34(6):118–125. Nash DA. Envisioning an oral healthcare workforce for the future. Community Dent Oral Epidemiol. 2012;40 Suppl 2:141–147. Watt RG. Strategies and approaches in oral disease prevention and health promotion. Bull World Health Organ. 2005;83(9):711–718. NSW Ministry of Health. Oral Health 2020: A Strategic Framework for Dental Health in NSW. Sydney: NSW MoH; 2013. Available from: http://www.health.nsw.gov.au/oralhealth/Documents/oral-health-2020.pdf. Accessed September 23, 2014. Centre for Oral Health Strategy NSW. Pit and Fissure Sealants: Use of In Oral Health Services NSW. Sydney: NSW Ministry of Health; 2013. Available from: http://www0.health.nsw.gov.au/policies/pd/2013/pdf/PD2013_025.pdf. Accessed December 8, 2015. Centre for Oral Health Strategy, NSW. Oral health. 2008. Available from: http://www.health.nsw.gov.au/oralhealth/pages/default.aspx. Accessed May 23, 2011. Ford PJ, Farrah CS. Oral health therapists: what is their role in Australian health care? Int J Dent Hyg. 2012;11(1):22–27. Brocklehurst P, Ferguson J, Taylor N, Tickle M. What is clinical leadership and why might it be important in dentistry? Br Den J. 2013;214(5):243–246. Australian Dental Association. Dentists… Part Of a Caring Profession: Become a Dentist – Your Passport to a Brighter Future. Sydney: ADA; 2014. Available from: http://www.ada.org.au/app_cmslib/media/umlib/documents/products_publications/other%20publications/dentists%20...%20part%20of%20a%20caring%20profession.pdf. Accessed August 26, 2014. NSW Ministry of Health. NSW State Health Plan: Towards 2021. Sydney: NSW MoH; 2014. Available from: http://www.health.nsw.gov.au/statehealthplan/Publications/NSW-State-Health-Plan-Towards-2021.pdf. Accessed August 26, 2014. Aarons GA. Transformational and transactional leadership: association with attitudes towards evidence-based practice. Psychiatr Serv. 2006; 57(8):1162–1169. Ahovuo-Saloranta A, Hiiri A, Nordblad A, Mäkelä M, Worthington HV. Pit and fissure sealants for preventing dental decay in the permanent teeth of children and adolescents. Cochrane Database Syst Rev. 2008;(4):CD001830. Jenson L, Budenz AW, Featherstone JD, Ramos-Gomez FJ, Spolsky VW, Young DA. Clinical protocols for caries management by risk assessment. J Calif Dent Assoc. 2007;35(10):714–723. Clarkson JE, Young L, Ramsay CR, Bonner BC, Bonetti D. How to influence patient oral hygiene behavior effectively. J Dent Res. 2009;88(10):933–937. Centre for Oral Health Strategy NSW. Smoking Cessation Brief Intervention at the Chairside: Role of Public Oral Health/Dental Service. Sydney: NSW Ministry of Health; 2009. Available from: http://www0.health.nsw.gov.au/policies/pd/2009/pdf/PD2009_046.pdf. Accessed September 23, 2011. Watt RG, Sheiham A. Integrating the common risk factor approach into a social determinants framework. Community Dent Oral Epidemiol. 2012;40(4):289–296. Yevlahova D, Satur J. Models for individual oral health promotion and their effectiveness: a systematic review. Aust Dent J 2009;54(3):190–197. O’Leary Z. The Essential Guide to Doing Research. London: Sage; 2004. Glaser B, Holton J. Remodeling grounded theory. Forum Qual Soc Res. 2004;5(2):4. Centre for Oral Health Strategy NSW. Priority Oral Health Program and List Management Protocols. Sydney: NSW Ministry of Health; 2008. Available from: http://www0.health.nsw.gov.au/policies/pd/2008/pdf/PD2008_056.pdf. Accessed December 29, 2014. Australian Government Department of Human Services. Medicare teen dental plan. 2012. Available from: http://www.humanservices.gov.au/customer/services/medicare/medicare-teen-dental-plan. Accessed May 3, 2014. Marks A, Mertz E. Leadership Development: A Critical Need in the Dental Safety Net. San Francisco: Center for the Health Professions; 2012. Available from: http://futurehealth.ucsf.edu/Content/5763/Dental%20Director%20Issue%20Brief_FINAL.pdf. Accessed September 23, 2014. Nicol ED. Improving clinical leadership and management in the NHS. J Healthc Leadersh. 2012;4:59–69. Blinkhorn AS. Comparison of the dental health of adults and children living in NSW with their counterparts in the US and UK. N S W Public Health Bull. 2009;20(3–4):52–55. Cashmore AW, Noller J, Ritchie J, Johnson B, Blinkhorn AS. Reorienting a paediatric oral health service towards prevention: lessons from a qualitative study of dental professionals. Health Promot J Austr. 2011;22(1):17–21.